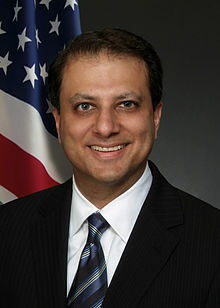 US attorney Preet Bharara, who made headlines when he arrested Indian diplomat Devyani Khobragade and subjected her to strip search ignoring the diplomatic immunity she had, has been fired by US President Donald Trump despite earlier assurances in November that he could continue. The immediate cause was not known but Bharara, the United States attorney in Manhattan since 2009, did not return a call from the White House the day before his firing order was served. He defended not returning the call citing protocol. Bharara was one of 46 United States attorneys appointed by President Barack Obama who were asked to resign but Bharara said on Twitter that he refused to resign and had been fired. Bharara’s office was in limelight for probing fund-raising by Bill de Blasio, the mayor of New York, the then governor of New York, Andrew M. Cuomo, who are both Democrats. When Khobragade incident took place, he refused to budge to the diplomatic immunity plea of the Indian diplomat and the incident flared up to virtual diplomatic showdown between the two countries. Indians were outraged at strip-search of their diplomat by U.S. Marshals and New Delhi retaliated by revoking the ID cards and other privileges of U.S. consular personnel and probing some of them for gay activities, which are against the Indian laws. Even the security barriers in front of the U.S. Embassy in New Delhi were summarily removed. However, Bharare pressed the case against Khobragade and the Indian government revealed documents that she was simultaneously associated with the United Nations, which keeps her status above the treatment meted out. Later, the US federal indictment was dismissed in March 2014, and Bharara’s office filed a new indictment but by then she had left the US. Bharara later speaking at Harvard Law School said that it was the U.S. Department of State which had begun the probe and asked his office to prosecute.